Abstract: PCstats knows overclocking. You know overclocking. This got us thinking though; what about underclocking? PCstats knows overclocking. You know overclocking. Everybody knows overclocking. The PC runs faster and hotter, provides more performance, and yadda yadda yadda. Overclocking has become so routine in the hardware world that every processor, motherboard, memory module and videocard needs to be overclocked as part of its review. We never know if the people actually buying the hardware care about its overclocking potential, but as computer journalists and enthusiasts, we know we have to test it out. This got us thinking though; what about under-clocking? Most modern processors and motherboards can just as easily run under a rated speed as it can run over... but is there a point to this? Well possibly. As you may know, there are passive heatsinks (meaning heatsinks without fans) available for just about every modern processor. The trouble is, a passive heatsink works by radiating its heat into the surrounding air, and to avoid heating up the case temperature unacceptably this usually means that the passive heatsink is complimented with an active case and powersupply fan. This is fine for most users who want a quiet PC, but what about applications that require almost absolute silence such as studio work? Case fans can generate some audible noise in an environment designed for quiet, and is this really acceptable? Professional studios can acoustically isolate computers, making this a moot point, but home audio enthusiasts don't have this luxury. The question is, how much heat and voltage can be dumped by underclocking a given processor (down) while still retaining acceptable processing performance? The purpose of this article is to take a very fast, very hot modern processor (in this case an AMD Athlon 64 4000+) and underclock it with an eye to comparing performance to levels of heat and voltage at below stock speeds. The Athlon 64 is currently the fastest available desktop processor, so we reasoned that reducing its speed to the point where it could be operated silently with a passive cooling system should still leave us with a powerful machine for everyday tasks. Let's take a quick look at the equipment we used to carry out this underclocking experiment. 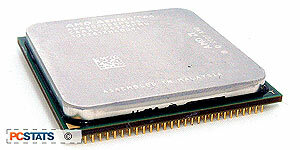 An AMD Athlon 64 4000+ processor (0.13-micron manufacturing process) was chosen for a number of reasons. First of all, it's the most powerful (single core) desktop processor available right now, so we figured it would probably give us the most performance when underclocked. Secondly, the fastest Athlon 64 runs slower in terms of GHz than the fastest Intel Pentium 4 chips (2.6GHz as compared to 3.8GHz), so we hoped it would take a proportionally smaller drop in speed to reduce its heat output to more acceptable levels. For this article an Athlon 64 4000+ CPU which runs at a stock speed of 2.4GHz was used. Cool'N'Quiet was disabled for all tests. 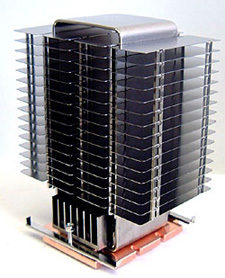 The Scythe NCU-2000 passive heatsink resembles a Soviet-era apartment block mounted on a copper plate, but it's one of the few passive coolers capable of handling the massive heat output of a fully-loaded K8 Athlon 64 4000+ processor. The NCU-2000 heatsink uses a form of heatpipe technology to carry heat from the copper plate to the array of thin aluminium fins which rely on convection cooling or case airflow to cool them. To simulate a typical case environment, we mounted a 120mm fan 12 inches from the Scythe NCU-2000 heatsink, providing it with a mild breeze to simulate case airflow. A Fluke digital thermometer was used to take temperature readings, with its thermocouple probe mounted to the copper plate of the heatsink. Also, we liked that the DFI NF4 SLI-DR motherboard allows for a core voltage of just 0.8V, which is good since we want to reduce the amount of heat produced by the processor as much as possible. In conjunction with the DFI NF4 SLI-DR motherboard we're going to need some fast... or is it slow?... memory. 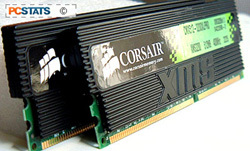 For this we used a pair of Corsair's TwinX 1024-3200XL Pro dual-channel DDR (2x512MB). The key here was choosing memory with good low latency properties. The DFI NF4 SLI-DR motherboard is a PCI Express based system, and since have plans to test 3D performance with an underclocked processor as well, we wanted to use a high-end gaming card. The PCI Express-based MSI RX800XT-VTD256E videocard ended up filling in this role.